John Usher, with his elder brother Andrew, developed the whisky business they inherited from their father. Andrew, and another brother, Thomas, are also buried in Grange Cemetery. The whisky business was very profitable, and in 1898 John made an offer to the University of Edinburgh that, if they would create a Chair of Public Health, he would build and equip a laboratory and class rooms to be used exclusively for the teaching of Public Health provided that the building was called ‘The John Usher Institute of Public Health’. The Institute was built and was opened by the Principal and Vice Chancellor of the University, Sir William Muir, on Wednesday, 11th June 1902. For his generosity, John was made a Baronet, Sir John Usher of Norton and Wells. John was born on 18th January 1828, and married Mary Anne Balmer (1831-1902). They had eight children. His son Robert was the second Baronet, and the line survives to this day. 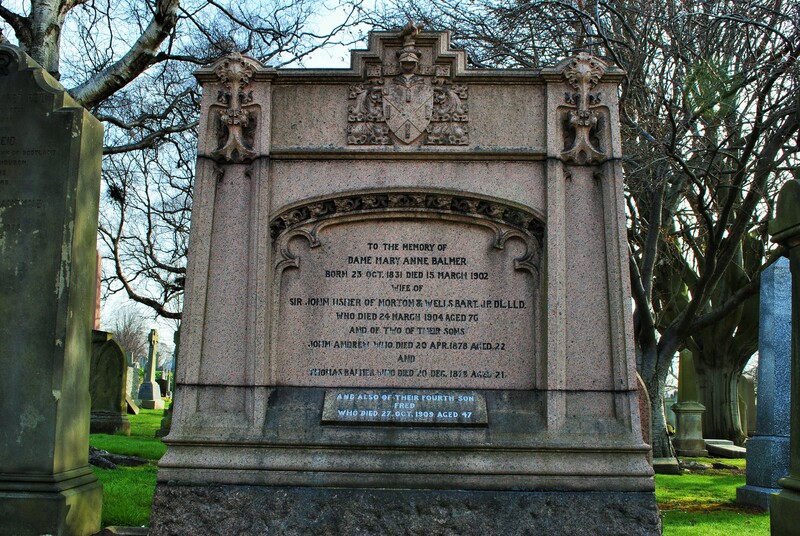 John died in Cairo on 24 March 1904. 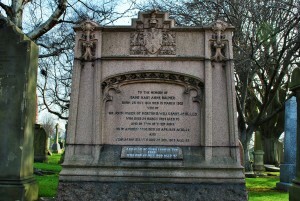 Three of his sons are commemorated on the monument: John Andrew (1856-1878), Thomas Balmer (1857-1878) and Frederick (1862-1909).